I’ve just finished a rather excellent book, The Innovators by Walter Isaacson. It takes a wonderfully long term view of digital – starting with Charles Babbage and Ada Lovelace and ending with Larry and Sergei in more recent times. I thoroughly recommend it. At the end is a magnificent concluding chapter, identifying the lessons that the history of computers offers to those wanting to innovate themselves. They may, perhaps, be surprising. Firstly, creativity is a collaborative process. The notion of a lone innovator is essentially a myth. Individuals do have ideas of course, but to make them happen they need to be a member of a team. Solo brilliance just isn’t enough. A good (or, rather, bad) example of this in the book is William Shockley, a brilliant mind who made several vital intellectual leaps in the development of the transistor, but whose personal style meant he was unable to take people with him and was a poor collaborator. The team needs to bring together people with different skills and complementary styles. One common arrangement is to have a visionary paired with a great operations person – the two Steves at Apple are a classic example of this. Jobs provided the vision and Wozniak did the actual doing. Another lesson from the book is that truly innovative ideas take root when nobody seeks the credit – whether as organisations or as individuals. The internet is a great example of this. When Vint Cerf and colleagues were writing the specifications for the protocols that would establish the Internet, they called them ‘requests for comment’ rather than anything more formal. It made all those involved feel ownership of the process and so encouraged them to fall in line. Third, money is not always the primary motivation in digital innovation. The digital revolution was spurred on by three main groups – government, private enterprise and communities and each was as important as the other in the story. The US government in particular, through the military, provided the funding for the research to take place to develop new ideas. private enterprises then sprung up to develop them into products. Meanwhile, others through a process of what Yochai Benkler refers to as “commons based peer production” helped to figure out what all this meant for individuals and communities, which created the use cases for the technology and also developed new ideas themselves. Only one of those groups has profit as its primary motivation. That’s not to denigrate private enterprise’s role at all – it is vital and few if any of the innovations would have worked without it. However, societal and community focused benefits matter just as much and are an important part of the mix that generates disruptive change. Finally, and perhaps most interestingly, many of those involved in the digital revolution were not “just” engineers, or scientists. A common thread is an appreciation of the arts as much as the sciences. Perhaps best exemplified by Steve Jobs’ idea of Apple being at the “intersection of technology and the liberal arts”, artistic creativity is a core driver of innovations. This takes us all the way back to Ada Lovelace and her description of Babbage’s early computer as being “poetical science”. This creativity is still the one thing that humans can do much better than machines, which leads us to another of Isaacson’s lessons, which is that people and computers working together in a kind of symbiosis is where the real sweet spot in digital innovation lies, rather than in artificial intelligence. Instead of trying to make machines that act like humans, we should leave the computers to do what they are good at – crunching through data and calculations – which frees up the people to do the creative, intuitive bit that machines struggle with so much. Great innovation, then, is a balance – between art and science, between individual brilliance and collaboration, between humans and machines. Something well worth thinking about and bearing in mind as we head into a new year. …and you really ought to read it. Dave‘s last book, Business Reimagined, was a cracker. Full of insight, humour and delightfully short. I wrote a bit about it over on WorkSmart. Essentially, this book continues the conversation we started in Business Reimagined and is my call to action, for both individuals and organisations to become more familiar with the opportunity that the digital deluge places at their feet every single day. As we begin to understand it more, this opportunity will change what it means to be a customer, to be an employee or an employer and, as you will find out, will even change what it means to be human. We can no longer afford the luxury of either ignorance or fear of this potential. We must understand that the digital deluge is not a threat but a gift to our society, but it will be up to us to rise up to the challenge to make it work. It is bound to be a cracking book, and is now on top of my to be read pile (which currently towers over our house). You can get it now, in electronic format, for free. If you want a paperback, you’ll need to wait for Amazon to deliver it. Am hoping to grab Dave soon for a podcast to talk about the book. Is technology killing books and reading? A fairly interesting, if somewhat confused in places, piece in The Guardian a few days ago from the author Philip Hensher. He starts by pointing out the rather glorious way that slightly niche publishing projects can get off the ground thanks to crowd funding websites such as Kickstarter, and also the way in which it’s now possible to buy and download electronic versions of a writer’s entire output for a couple of quid thanks to the ebook stores. Ruth Rendell was commenting on one of the beneficiaries of the “long tail”, a once forgotten novel by John Williams, Stoner. Rendell suggested that it has become a huge success in 2013, compared with its small impact on publication in 1965, precisely because it celebrates the power of reading and the value of literature. In 1965 that was taken for granted. Now, Rendell suggested, reading has become a specialist activity, and Stoner is more “needful”. He goes on to suggest a literary equivalent of the doctor’s recommendation of five-a-day, replacing fruit and veg with books – and hopefully a slightly longer timeframe. I personally find that there are some works that I am perfectly happy to read on an electronic device, whether a Kindle e-reader or the app on my iPad (mini – the regular sized iPads are far to cumbersome to work well as a reading device). There are other books, however, which I need to be on paper in front of me. I’ve recently been reading the letters of DH Lawrence – which I heartily recommend – and it would be a far poorer experience were I to be reading them on a screen rather than being able to thumb through the pages. The sheer accessibility of literature now, thanks to the internet and resources such as Project Gutenberg, make it a fantastic time to be a reader. I suspect it is also a great time to be a writer, as the ebook market allows those authors who might never have got a book deal to find readers and perhaps make a living from their words. As to whether the distractions of the internet are stopping people from reading… well, I dunno. I have a sneaking suspicion that those who do not want to read have always found something else that they would rather do; and those who love books will always find the time for them, no matter what is happening elsewhere, virtually or otherwise. Posted on January 9, 2014 Categories BooksTags books, Reading2 Comments on Is technology killing books and reading? The Net Delusion by Evgeny Morozov looks like it will be useful and interesting reading for those interested in the internet and its effects on politics and democracy, providing something of an alternative (thanks to Dom for the wording advice) view. Morozov, a young Belarusian-born writer and researcher now based in the US, doesn’t mince his words. But The Net Delusion is considerably more than an assault on political rhetoric; for, it argues, behind many of the fine words recently spoken in praise of technology lies a combination of utopianism and ignorance that grossly misrepresents the internet’s political role and potentials. Unless we are very careful, he suggests, the democratising power of new media will in fact bring not democracy and freedom, but the entrenchment of authoritarian regimes. I’ve ordered the book for my Kindle and will report back once I get round to reading it. What is also very tempting is that Morozov will be speaking at the RSA on the 20th January, on the topic of ‘The Future of WikiLeaks’ (thanks to Catherine Howe for the tip off). Morozov believes that WikiLeaks currently stands at a crossroads: one route ahead would see a radical global network systematically challenging those in power – governments and companies alike – just for the sake of undermining “the system”. The current quest for transparency could soon become an exercise in anger, one leak at a time. Alternatively, WikiLeaks could continue moving in the more sensible direction that, in some ways, it is already on: collaborating with traditional media, redacting sensitive files, and offering those in a position to know about potential victims of releases the chance to vet the data. It is a choice between WikiLeaks becoming a new Red Brigade, or a new Transparency International. And, argues Morozov, forcing Mr Assange to go down the former route would have far more disastrous implications for American interests than anything revealed by “cable-gate”. I’d love to attend and hopefully my schedule will allow it! Another other great innovation book recommendations? Disclaimer – the links to Amazon are affiliate ones – if you buy something after clicking them I make a few pence. I’ve always wanted to own a bookshop. Somewhere nice and quiet, with tables to sit down and read, some sort of tea and coffee arrangement and plenty of books to browse and buy. I’m obviously not ever going to have one – after all, if Borders can’t cope, then how could I? But I can have a virtual arrangement, thanks to Amazon’s astore service. You can find it here. I’m still stocking the shelves, but you should find some good stuff in there. 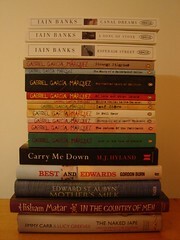 In fact, they are all books I have read and liked, so you can blame me if they’re crap. Disclosure – I get a few pence every time you use the bookshop. I’m not going to get rich out of it, though! Penguin, the publishers, have unleashed a cool idea: a novel written on a wiki. There’s a blog just for the project, too. Great that they are using open source tools: WordPress and MediaWiki. Over the next six weeks we want to see whether a community can really get together, put creative differences aside (or sort them out through discussion) and produce a novel. We honestly don’t know how this is going to turn out – it’s an experiment. Some disciplines rely completely on collaboration, while others – the writing of a novel, for example – have traditionally been the work of an individual working in isolation. But with collaboration, crowdsourcing and the ‘wisdom of the crowds’ being buzz words du jour, we thought we might as well see if these new trends can be applied to a less obvious sphere than, say, software development. Here’s the pathetic list of books I managed to read this year. Excuses: new job, wedding, house move.